Much of the chapter will focus on mechanisms of reaction. A reaction mechanism is, at the very least, the series of elementary steps needed to accomplish an overall reaction, and all of the intermediate structures that would be formed on the way from the reactants to the products. 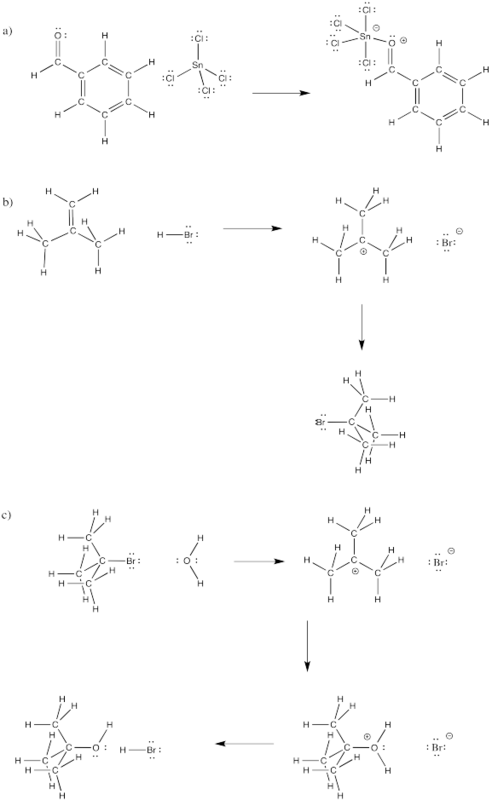 A reaction mechanism shows the structures of intermediates that occur after each elementary step. Consider the following reaction. It's called a keto-enol tautomerism. A tautomerism is just a reaction in which, overall, a proton or hydrogen atom has changed positions. The structure on the left is a ketone. The structure on the right is called an enol, because it has a hydroxyl group (OH) attached directly to an alkene carbon (C=C). Just by moving one hydrogen atom, we go from one structure to the other. Try drawing the reaction above using skeletal drawings instead of full Lewis structures. An elementary reaction is typically a bond-forming or a bond-breaking step. In a bond-forming step, a pair of electrons are donated from one atom to another. In a bond-breaking step, a pair of electrons that were shared between two atoms are drawn to one end of the bond or the other, so that the bond breaks and the electrons end up on one atom only. What are the elementary steps in a keto-enol tautomerism? What sorts of stops do we make along the way? These reactions can actually occur in a couple of different ways, depending on whether the compounds are in acidic conditions or basic conditions. In acidic conditions, there are extra protons floating around. They aren't all by themselves; remember, protons tend to stick to things that have lone pairs to share. Under basic conditions, there aren't a significant amount of extra protons around. There might be hydroxide ions or other nucleophilic species around. Nucleophile species are electron-donating compounds that are attracted to positive charges or electrophiles. We're going to look at this reaction under acidic conditions. If there are protons around, maybe some mineral acid has been added, such as hydrochloric acid or sulfuric acid. Those things are typically used in water, so we'll assume there is some water around. We have hydronium ions (H3O)+ in solution. There must be some counterion, too, but we'll ignore it. Under those conditions, what will the first step look like? Maybe a proton is transferred from the hydronium ion to the oxygen atom on the ketone. That would get us halfway there. Remember, the keto-enol tautomerism involves addition of a proton to that oxygen. Is this event possible? Think about precedents. Have you seen an oxygen atom with a proton attached to it before? Of course, there are alcohols, and even the enol we are thinking about. What about if the oxygen has a positive charge? Well, that was the case in the hydronium ion. Maybe it is OK here, too. So that protonated ketone seems like it might be a reasonable intermediate in this reaction, provided the reaction happens in acidic media. In fact, this transfer is generally accepted as part of the mechanism and is supported by experimental evidence. Let's pause for a second and think a little bit more about what is happenning. There is a bond being made and a bond being broken during this transfer. Bond-making and -breaking events are the hallmark of chemical reactivity. Maybe we should pay a little more attantion to how those events are happenning. The bond-making event involves the carbonyl oxygen. What differences do you see at that atom before and after the transfer? Certainly a proton has appeared, and a positive charge, but there is also a lone pair missing. Where did it go? On the hydronium ion, meanwhile, a lone pair has appeared along with the departure of the proton. Where did that come from? Of course, a covalent bond is a pair of electrons shared between two atoms. If we are making and breaking bonds, electrons are playing a prominent role. It may be useful to illustrate the role they are playing. Very often, curved arrows are used to show the path that electrons take in these elementary steps. These arrows are always drawn from the source of the electrons to the place to which the electrons are attracted. These arrows help to illustrate bond-making and bond-breaking steps and also serve a book-keeping function, helping us to keep track of electrons over the course of the reaction. Notice that, in the elementary step shown above, a bond forms between the carbonyl oxygen and one of the protons on the hydronium ion (H3O+). A covalent bond is a pair of electrons shared by two atoms. Where do the electrons come from to form that bond? They used to be a lone pair on the carboyl oxygen. A curved arrow is used to show that. At the same time, the bond breaks between that hydrogen and the oxygen in the hydronium ion. Where do those electrons go? They become a lone pair on the oxygen. Another curved arrow shows that event. We're not finished, yet. What happens after that initial transfer? It seems reasonable that we might just take a proton off the carbon next to the carbonyl. That position, right next to the carbonyl carbon, is called the alpha position. We are taking a proton that was attached to an alpha carbon. Is it OK to take protons away and break C-H bonds? Only sometimes, but this is one of those cases. Removal of a proton from an alpha position happens all the time in organic and biochemical reactions (those involving carbon-based molecules, and those involved in living systems). Filling in curved arrows shows the bonds have been made or broken. Curved arrows from the nucleophile to the electrophile show the path of electrons in the reaction. Curved arrows illustrate bond-making and bond-breaking events. Sometimes, only one arrow is required in showing an elementary step, but not always. Often, a bond-making step can happen at the same time as a bond-breaking step. This usually happens when an atom isn't large enough to accommodate the electrons from the new bond and sill keep the electrons from an old bond. In this case, two pairs of electrons move in the same elementary step, so two curved arrows are shown. Very rareley, more than two curved arrows are needed to show the events in one elementary step. This is how chemists have thought about reactions, on paper, for about a hundred years. Always they try to draw a sequence of reasonable intermediates along the course of a reaction. Reactions rarely happen in one step, especially if multiple bonds are formed and broken, although you will eventually learn about some that happen that way. Usually, especially in organic and biochemical reactions, curved arrows are used in an attempt to map out the movement of electrons. Draw the entire keto-enol tauomerism mechanism shown above using skeletal drawings rather than full Lewis structures. Remember, it is important that you still show the lone pairs, for electron accounting purposes. Sometimes other information is displayed in a reaction mechanism. Computational chemists will often leave out the curved arrow notation but will instead indicate the relative energy differences between all the intermediate structures along the reaction pathway. These energies may be experimentally determined (i.e. they may be based on the measurement of real reactions) or they may be calculated using an appropriate level of quantum theory. The energies may be displayed numerically, possibly in a table, or they may be illustrated using a picture, such as a reaction profile. Fill in curved arrows on the following mechanisms. 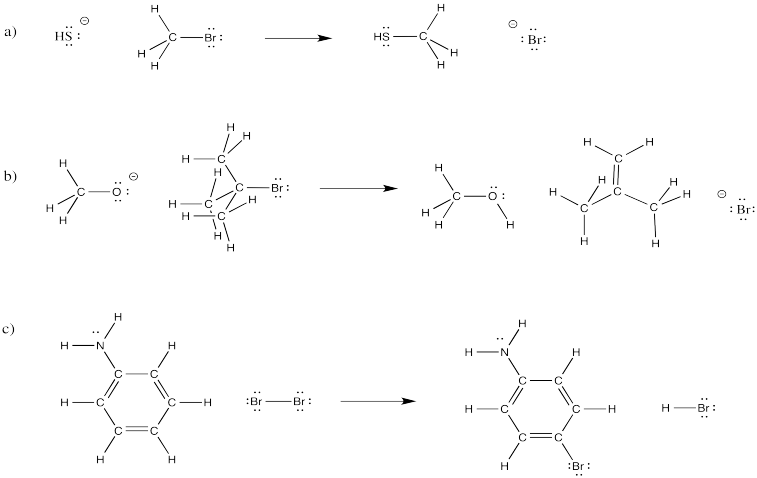 In the following overall reactions, identify where bonds have been broken and where bonds have been made. In the following reactions, specific atoms have moved to specific places. Propose elementary mechanisms for these transformations. Propose a mechanism, with arrows, for the keto-enol tautomerism above, but this time under basic conditions. Assume there is some sodium hydroxide dissolved in aqueous solution.